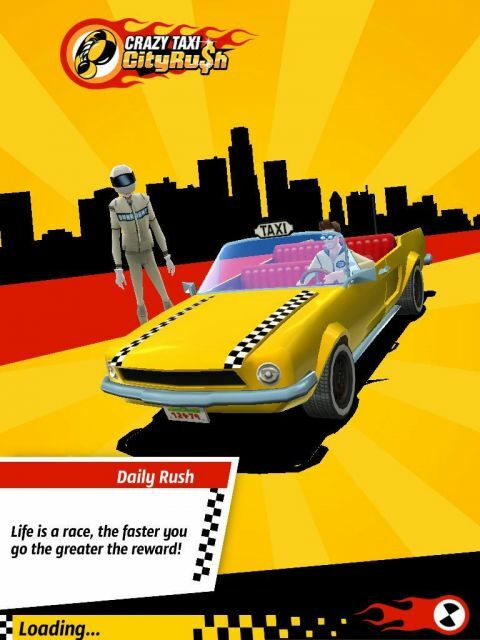 Crazy Taxi City Rush is SEGA's latest foray into the free-to-play space, and has received a lot of criticism for the way it uses In App Purchases to monetize the game. 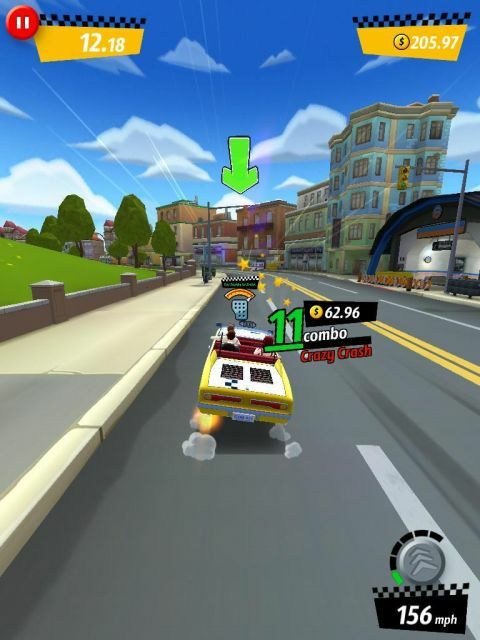 At its heart though, Crazy Taxi: City Rush feels like a Crazy Taxi game, so the question is, is that enough to warrant your time, and your patience, when it comes to the ads? 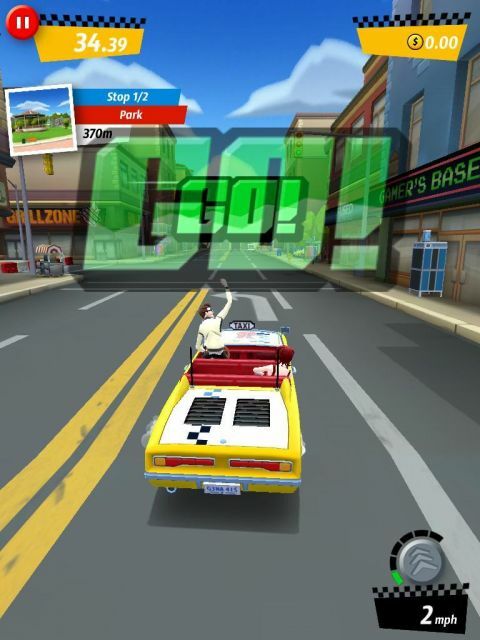 Developed by Hardlight Studios, who also produced the Sonic Jump games, City Rush sees you driving a taxi in a what is essentially a lane runner. The developers had to make the decision, and it was a brave one, to either allow people to drive at their own free will through the city, or to limit them as they have done, to lanes, or some other on-rails mechanic. From playing the game, it doesn't take long to realize it was the correct choice. You don't have to accelerate or brake for corners in City Rush - though you do brake to stop the car to drop people off (this was a key part of the original Crazy Taxi - trying to slam the brakes on to stop in the target, so it's nice that it's still here too). Cornering is performed by holding on the left or right hand side of the screen, and while it doesn't take any real amount of skill to pull off, it does see your car performing a satisfying powerslide in the direction you have indicated. The main element of skill comes from picking your route through the traffic. As with previous Crazy Taxis, your main goal is to take a customer from point A, to point B. If you get them there within the time limit, then you win. Picking your route to avoid other cars makes this feel like other lane runners, but the setting makes it seem a lot more organic than its competitors. If you get in a tricky situation you can also boost through traffic, knocking it out of the way. If you hit other cars at regular speed then you will just find yourself slowing down. There are also racing elements, for example you will have the opportunity to play daily challenges in order to win rewards, and these take the form of classic checkpoint racing. The initial area you have to play in is reasonably small, and before long you will find yourself retracing old ground. There are 'missions' that you pick, rather than finding random customers on the street as with other Crazy Taxis. You unlock new areas and new missions by completing the previous ones. There are a host of taxis to choose from in each area, all with unique stats. You can customize them and upgrade them too, giving each one a bit more personality. Further to this, you can choose your own character model. This makes the replay feature a little more sensible, as you will eventually have a character and car that feels your own, but otherwise it feels more like a way to get the game spread on social media. This is definitely a fun game, and if you've played a lot of free-to-play games before you won't feel too shocked by some of the techniques used to monetize it. However, it's the combination of all of these, nearly every single technique in the book, that gets a bit overbearing. You will be prompted to pay to get Gems, which you can also get through general play, at nearly every turn. Upgrading your car, buying new taxis, skipping wait times, removing ads (which are pretty intrusive - you are forced to watch 5 seconds of videos, for example, before being able to skip) and the whole energy system in the game, which actually physically prevents you from completing more than four events before you have to wait for 15 minutes for it to recharge one segment (out of the starting total of four), are all in play here. 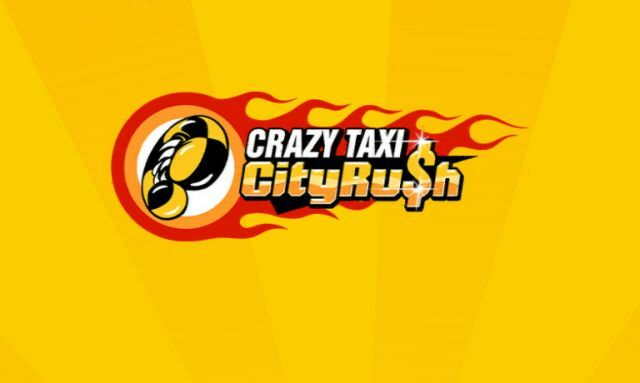 City Rush has to be commended for its looks. Your opinion of the soundtrack will likely depend on how much you like that style of music, but it is a bright and colorful game and that cannot be denied. The palette is similar to the likes of Subway Surfers, but where that takes place on a narrow plane, this is a reasonably dense city, with impressive draw distances and character models. Fans of Crazy Taxi should definitely play Hardlight's work, if not just to see how the game can be evolved for mobile gamers. Of course, the original is still available to buy, but the way the game has been merged into a lane runner has made it so much more well-suited for handheld devices. It's a great game to show off touch controls, your device's graphics, and just for nostalgic memories of days gone by, but be aware that you will find yourself frustrated at the constant messages to buy, buy, buy at almost every turn on this wild ride. INheritage: Boundary of Existence tells ..
"I found this game to be extremely fun. ..